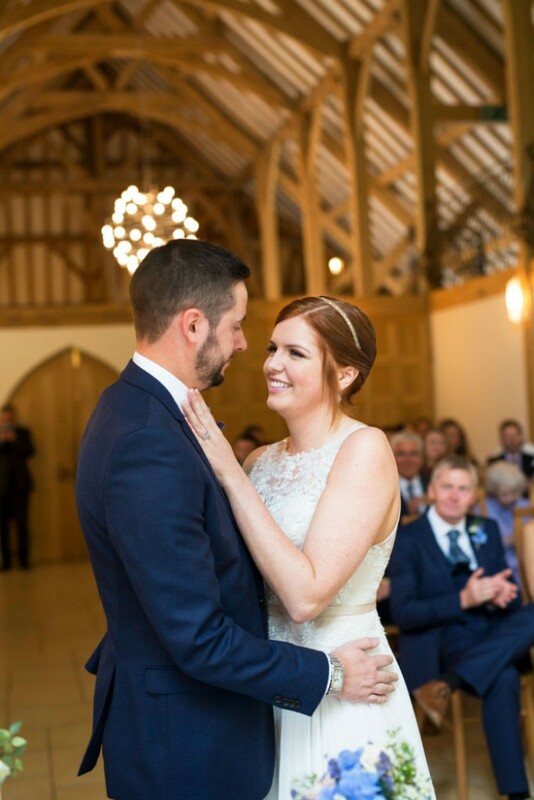 “It was the most perfect day. 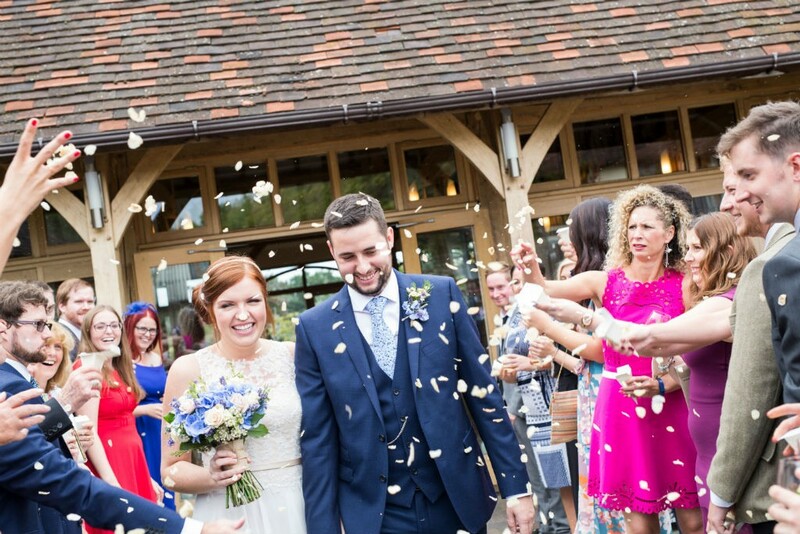 Amy & Jamie are a lovely couple – I first met them at Costa in Winchester back in 2015. 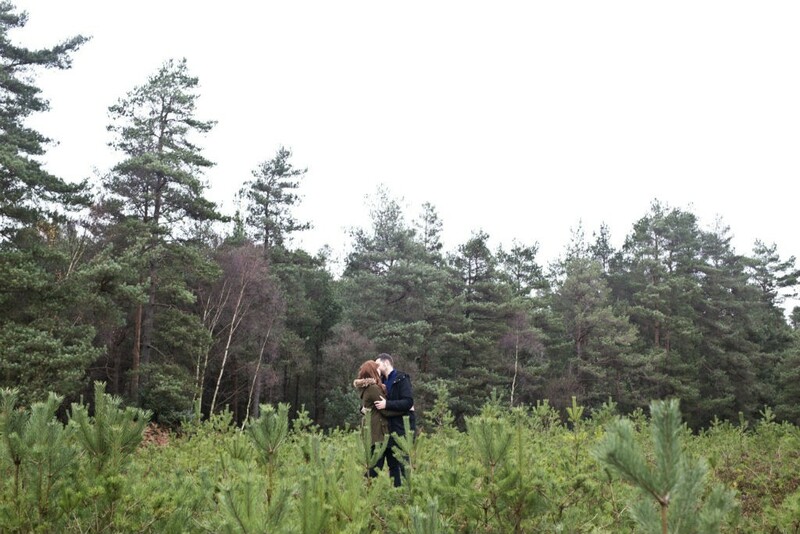 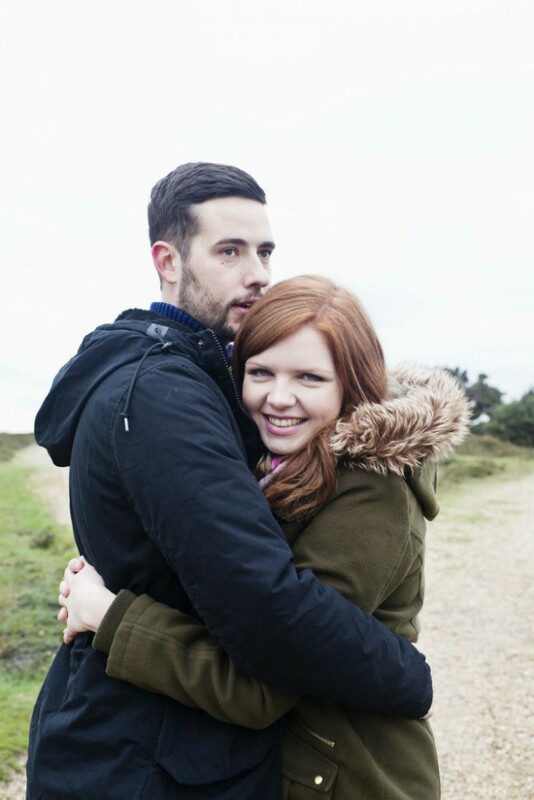 As with all my clients, we kept in contact via email & pinterest over the coming months & met for a pre-wedding session in the New Forest a few months prior to the wedding. 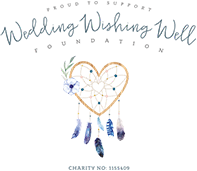 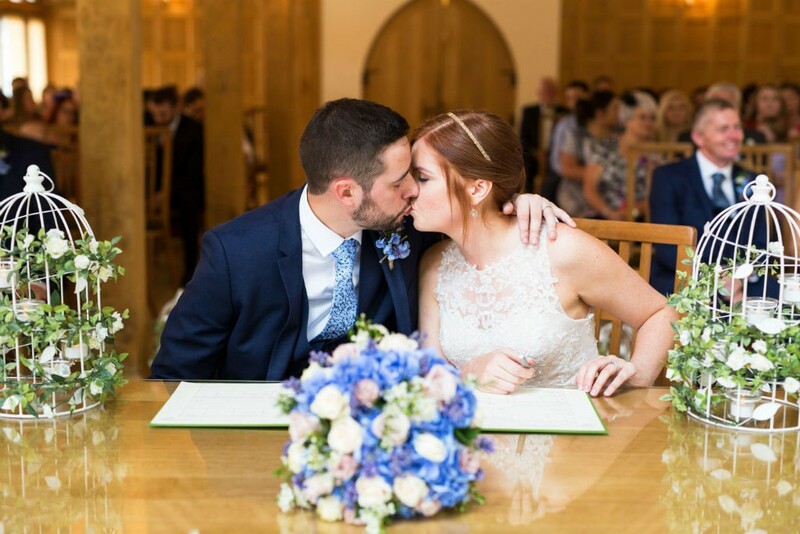 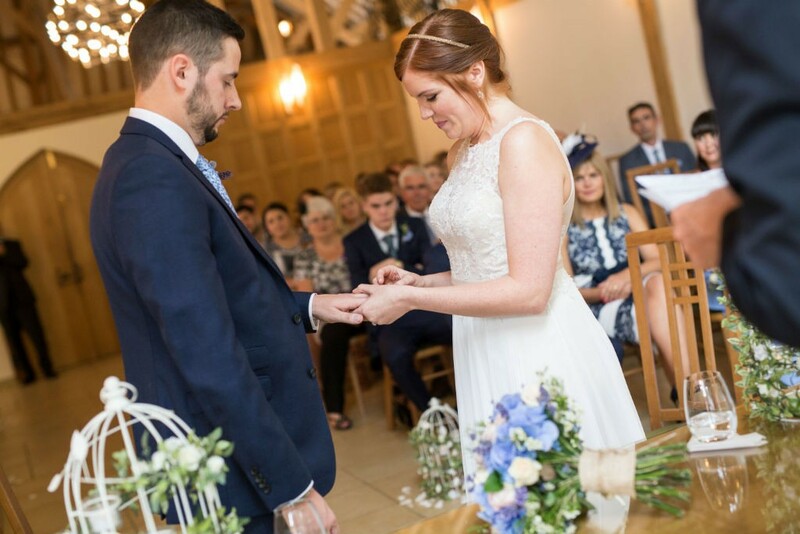 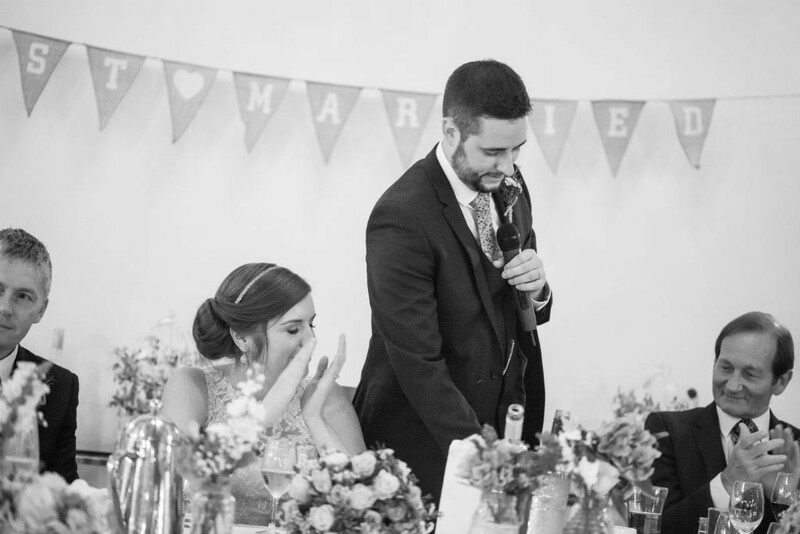 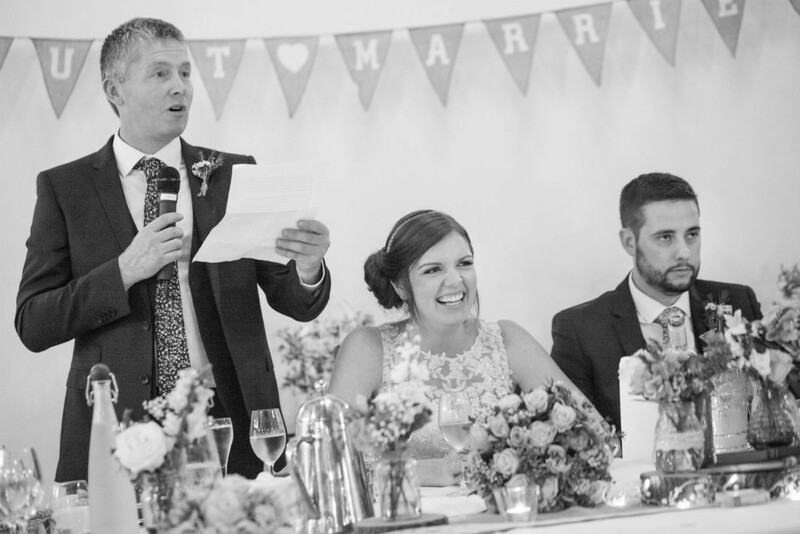 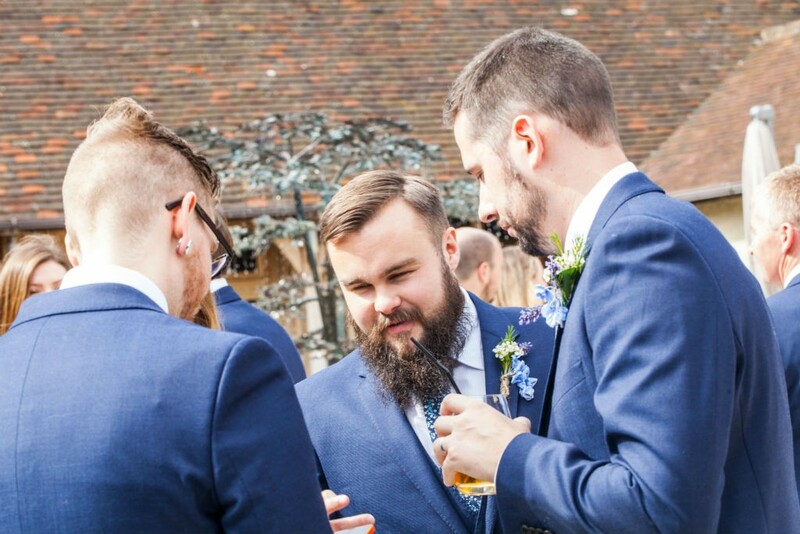 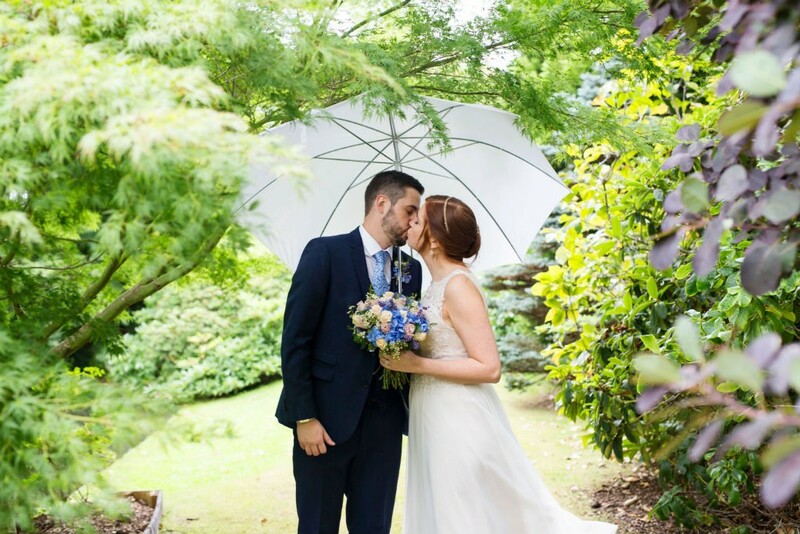 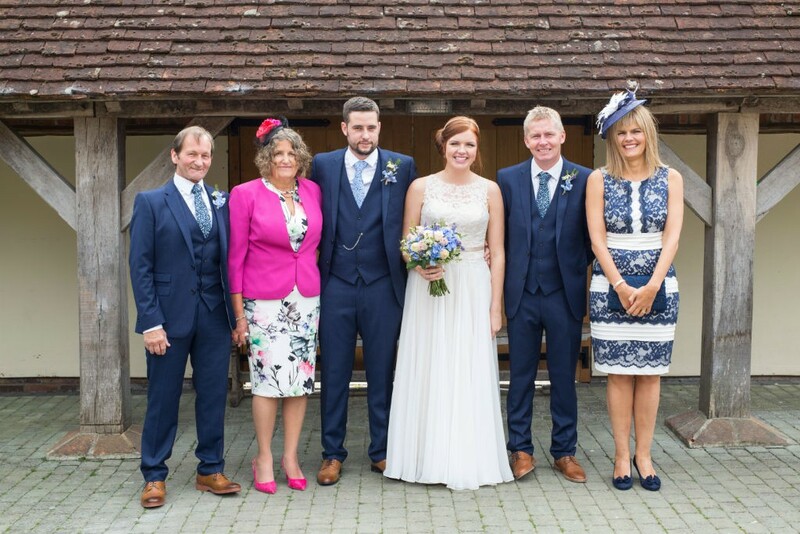 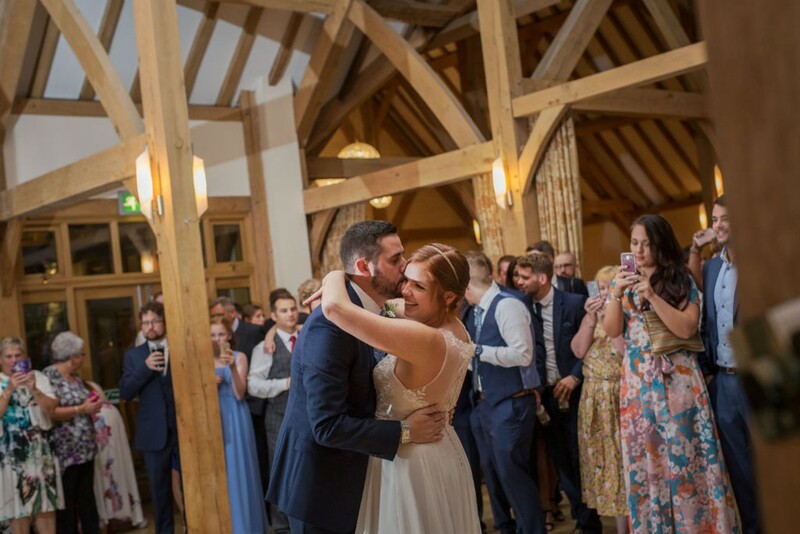 Here’s a little about the couple – They met while working at Game Head Office in Basingstoke in December 2011 & first started talking to each other at the Christmas party & started dating soon after. 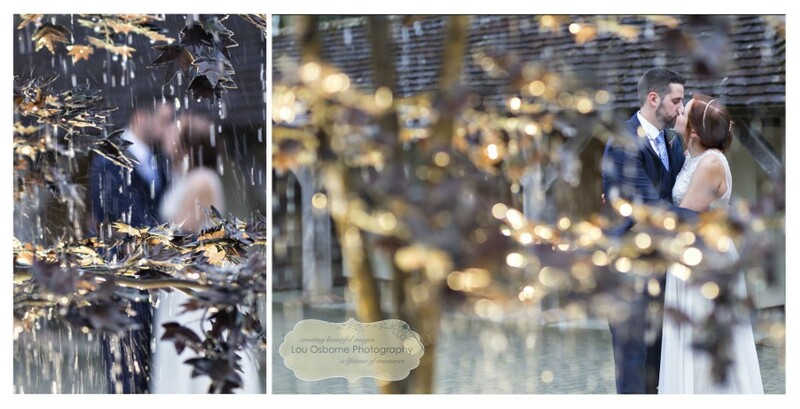 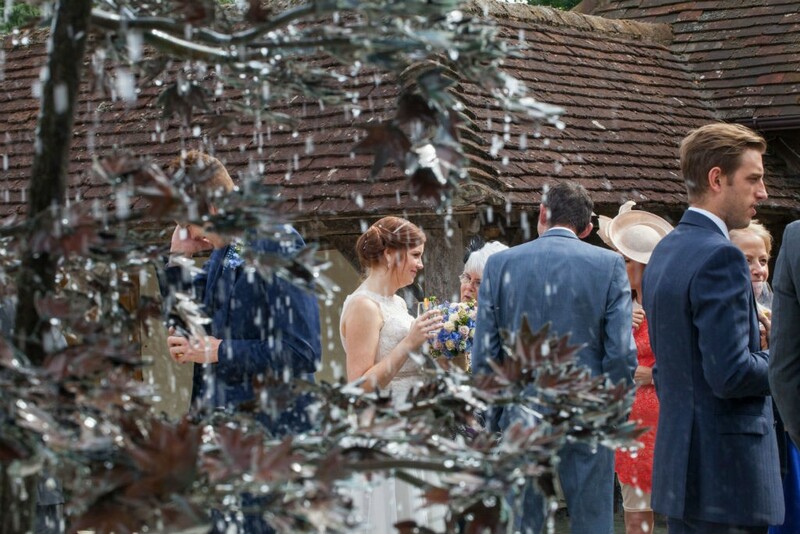 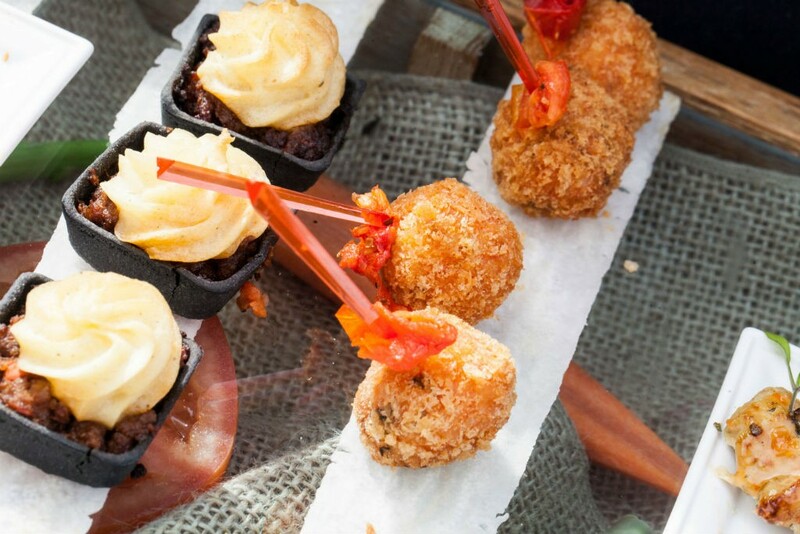 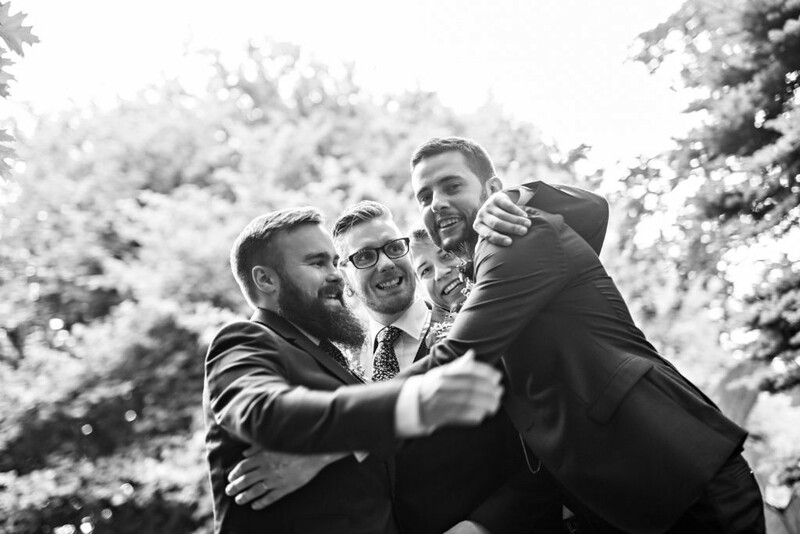 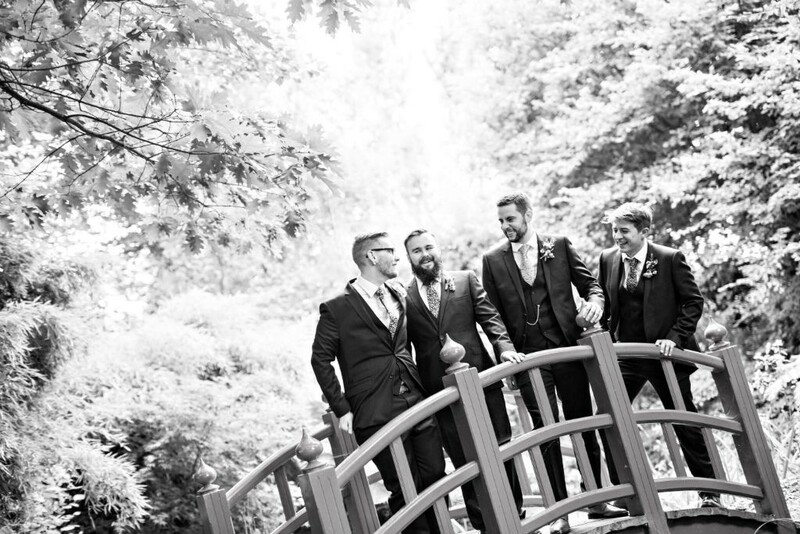 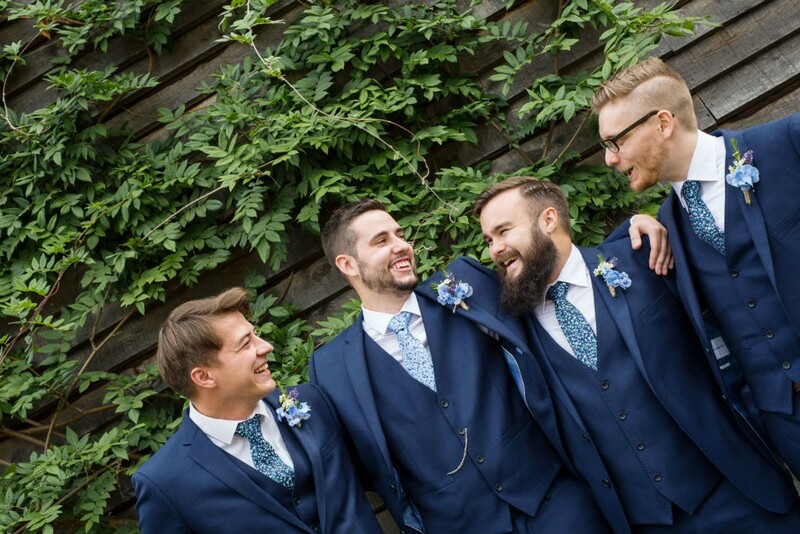 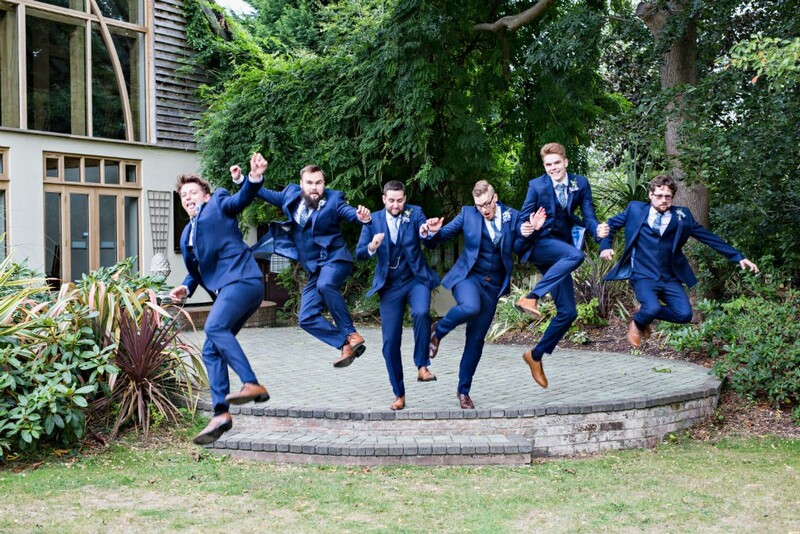 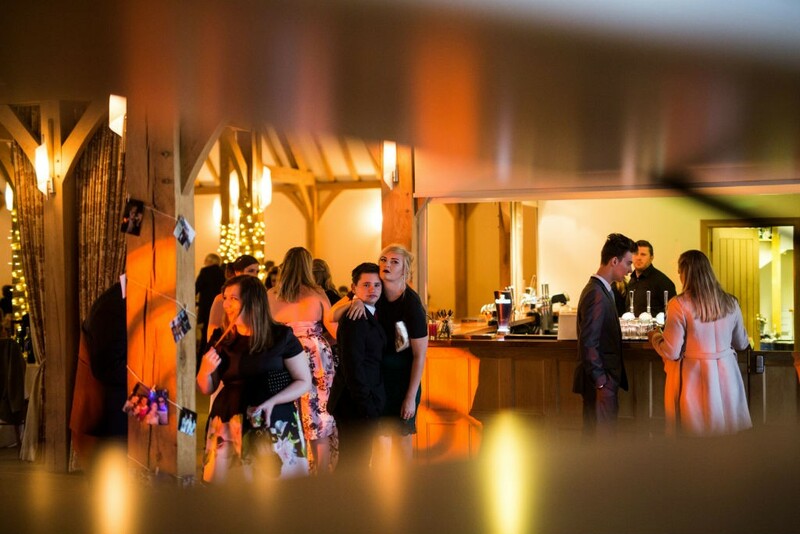 The Venue – “It ticked all the boxes for us, the gardens looked amazing and the layout of the venue was perfect! 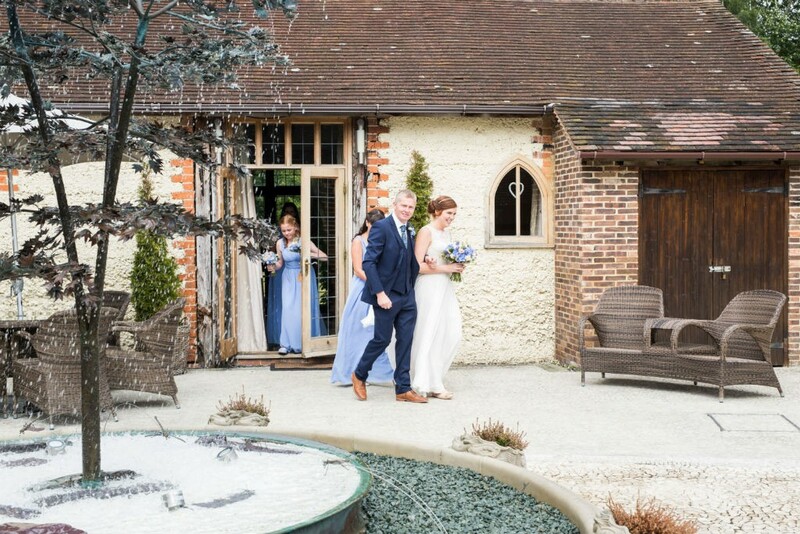 As soon as we walked into the venue we knew it was the place we wanted to get married in. 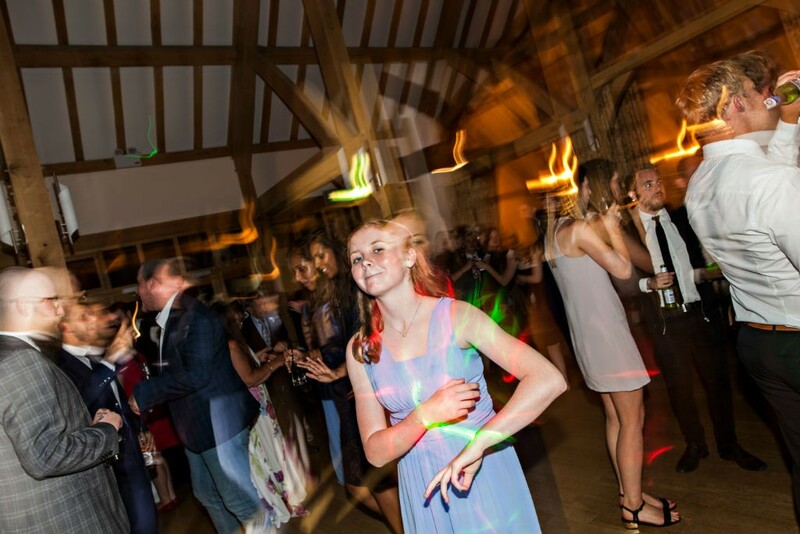 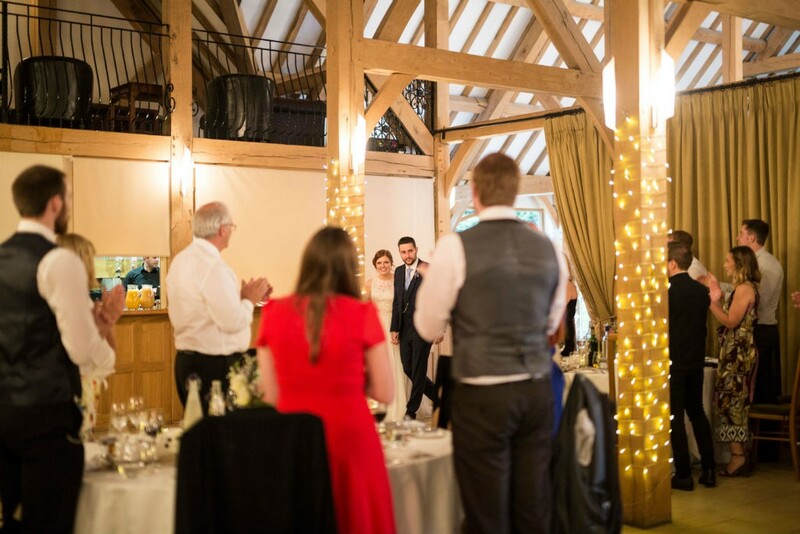 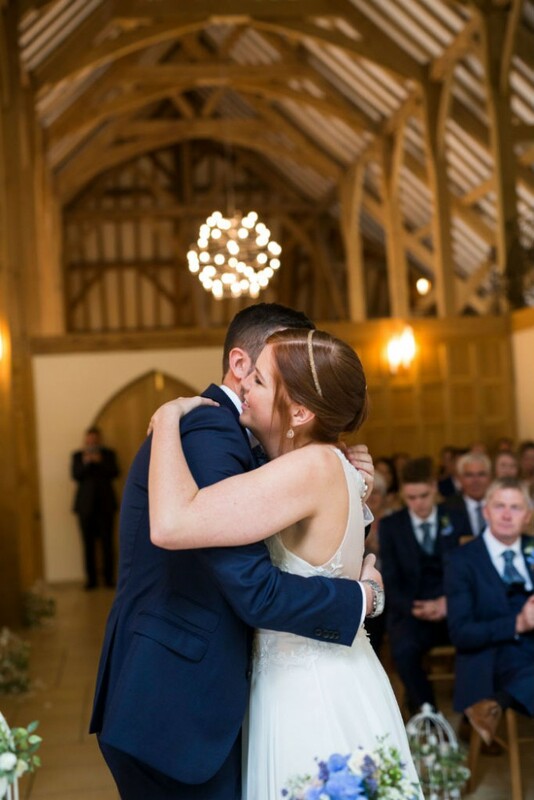 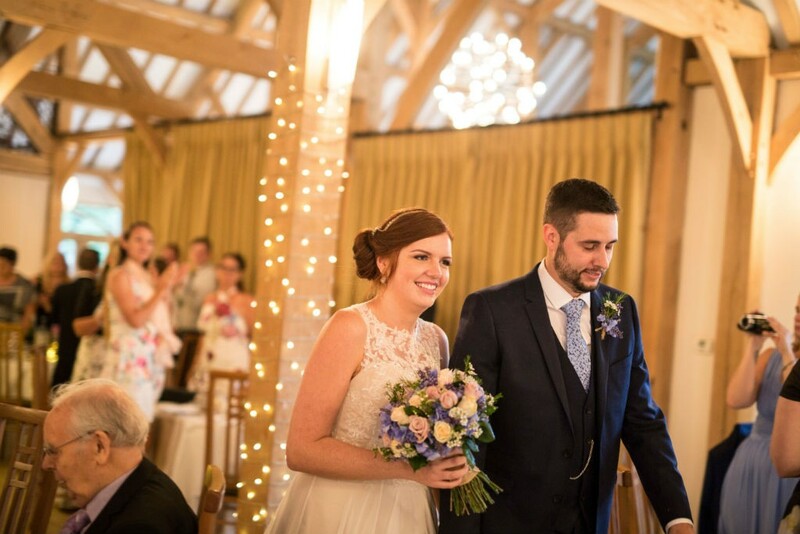 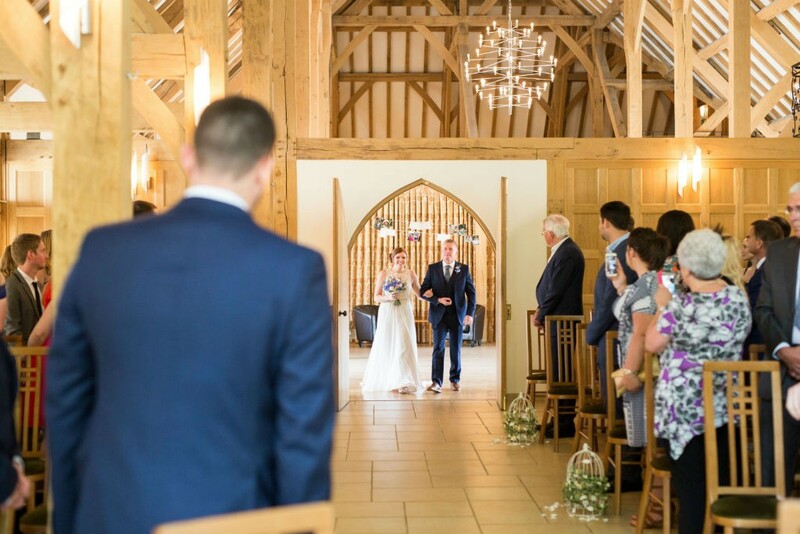 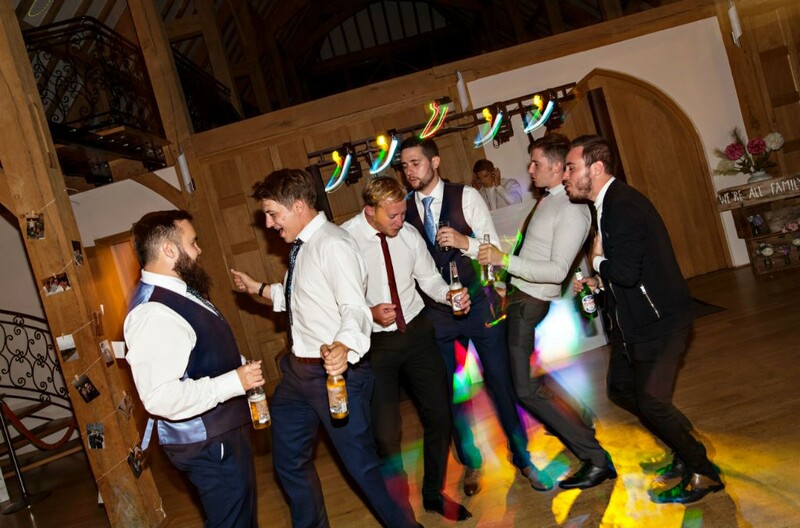 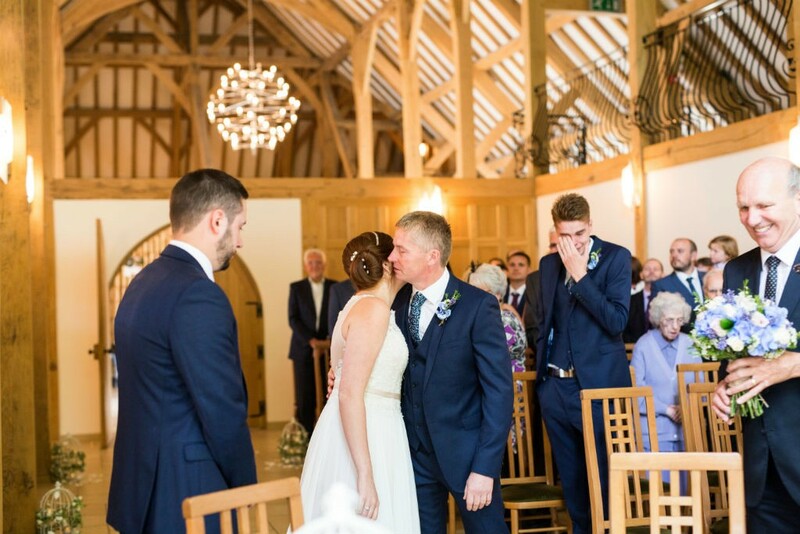 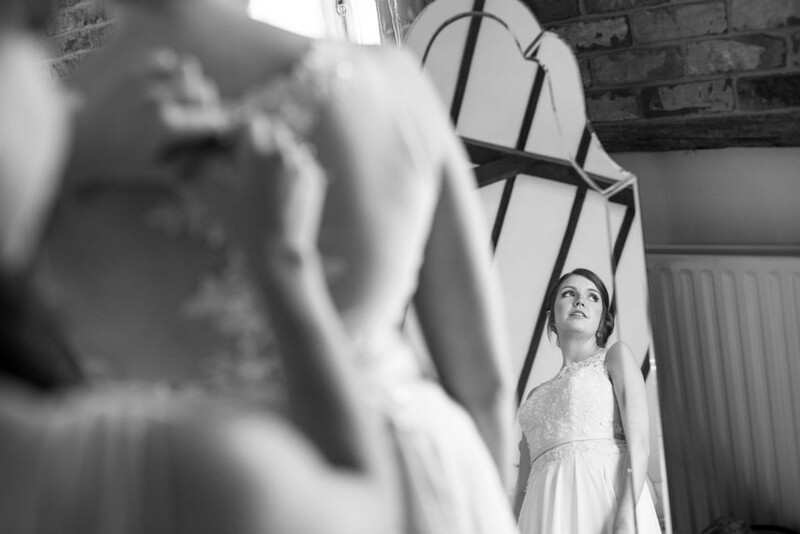 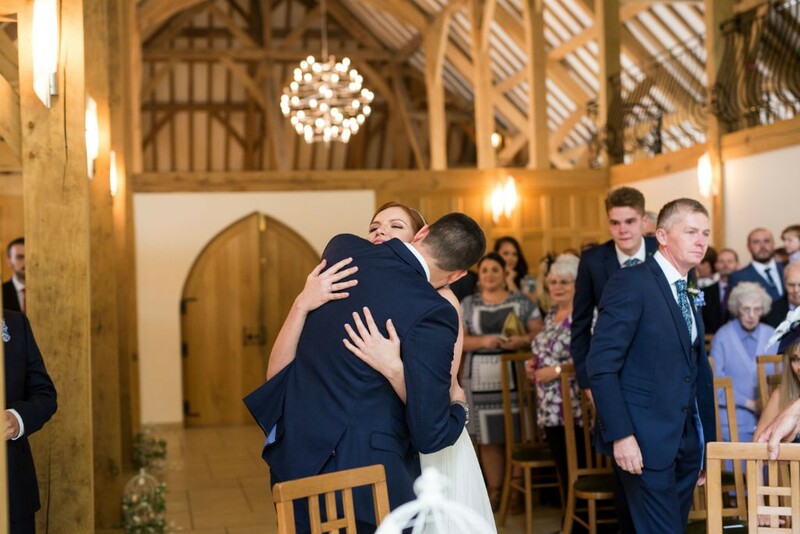 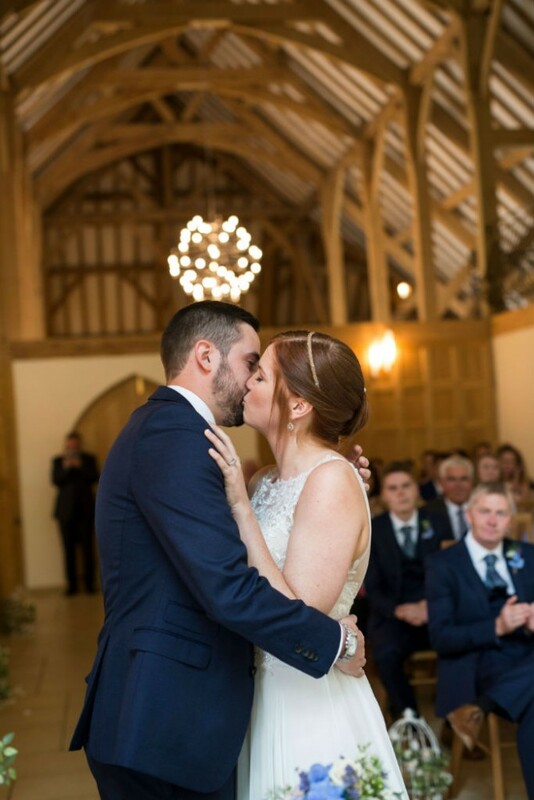 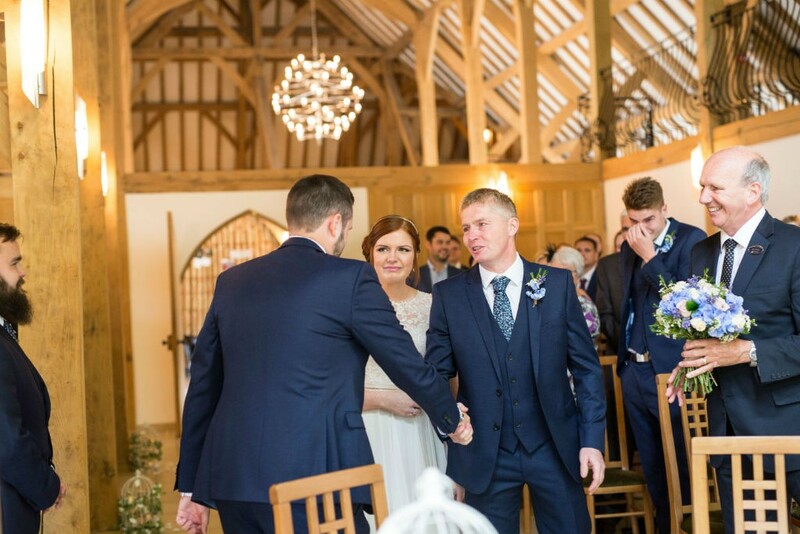 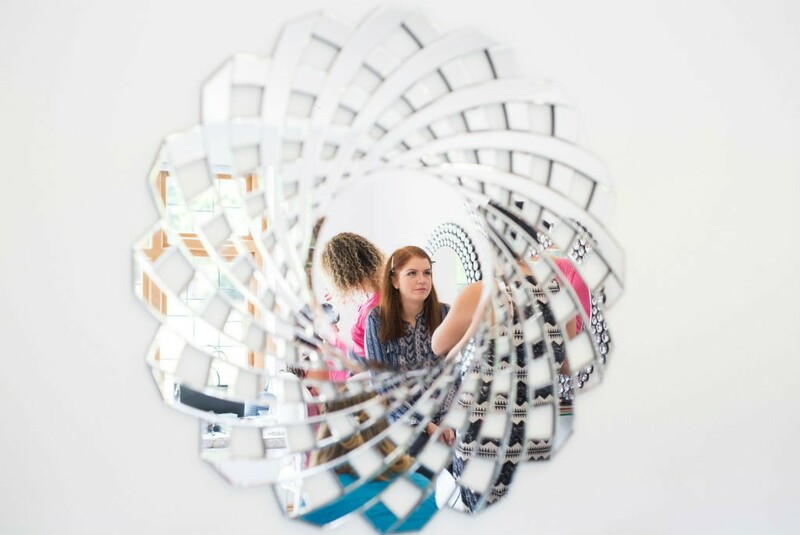 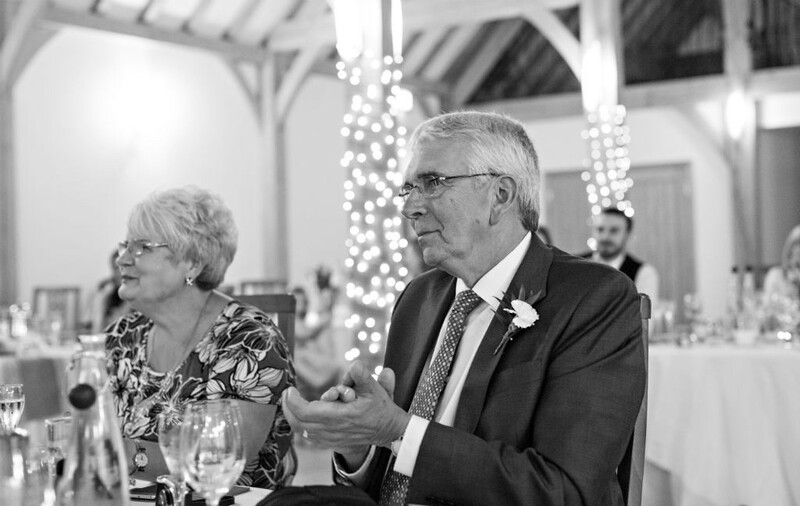 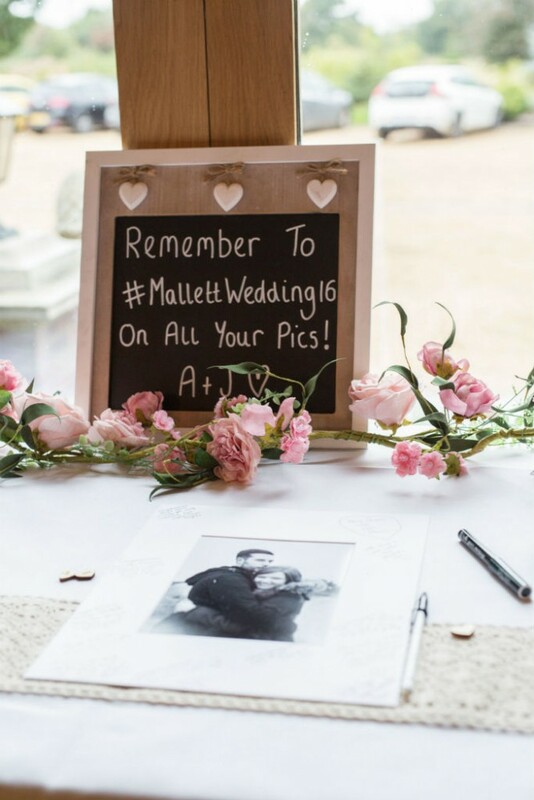 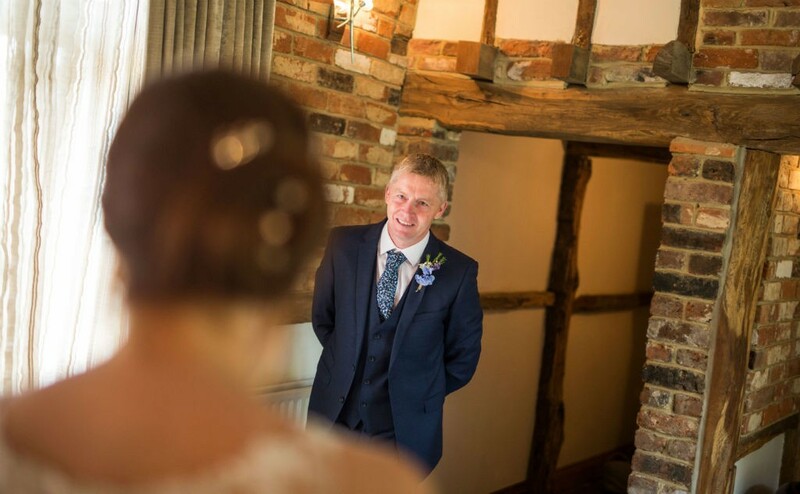 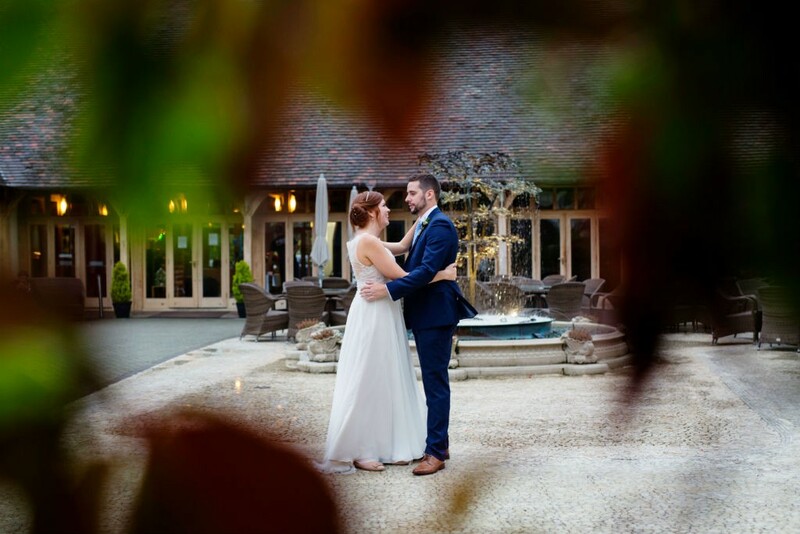 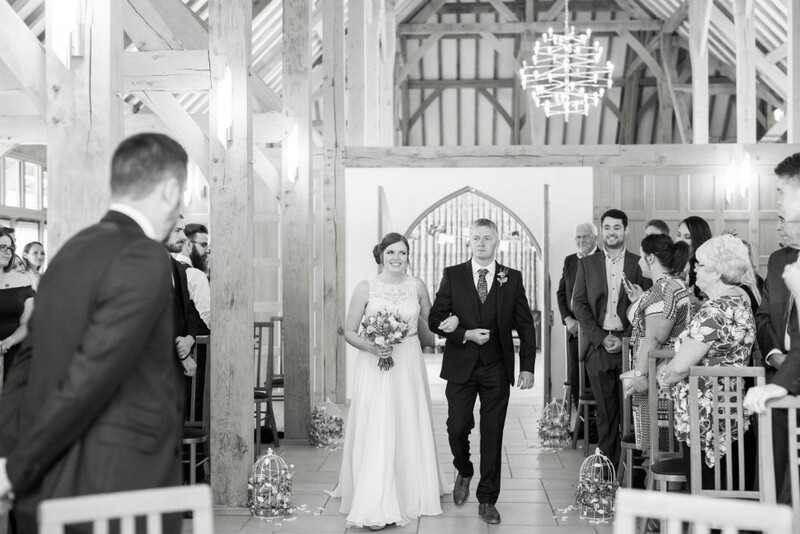 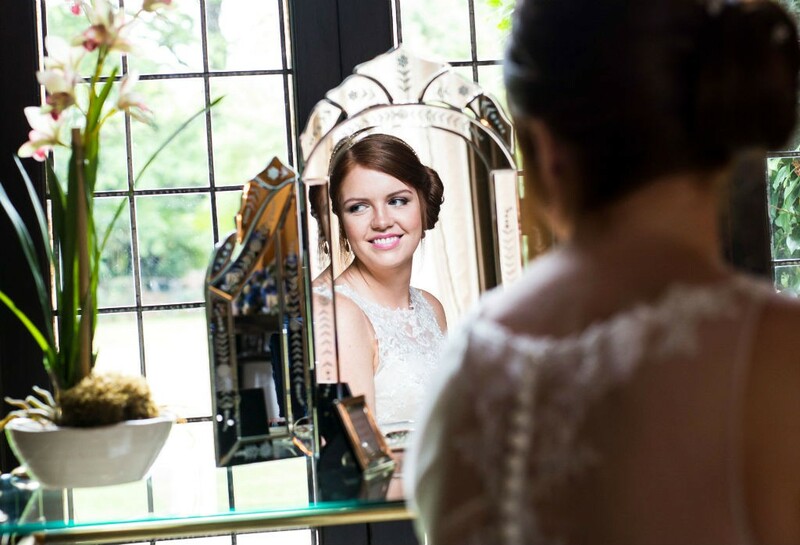 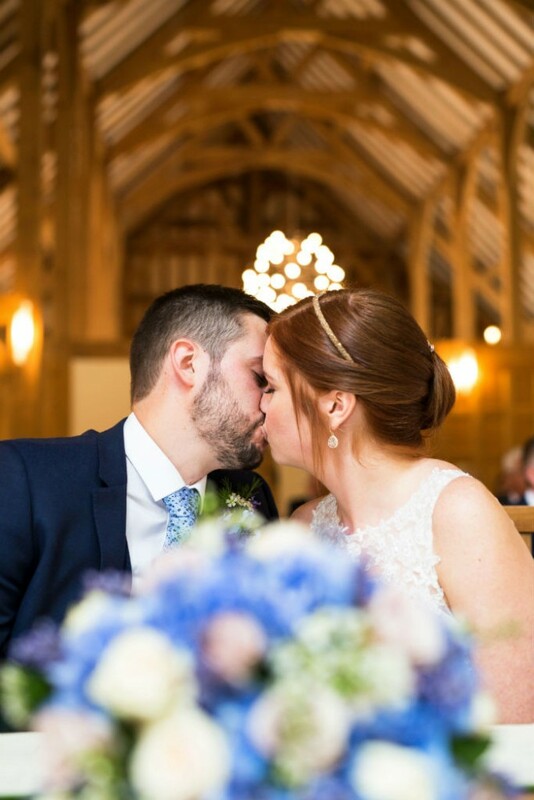 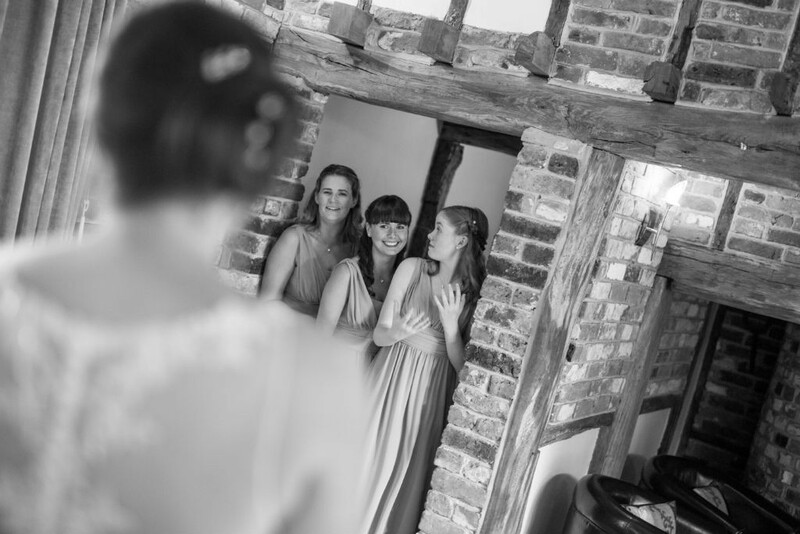 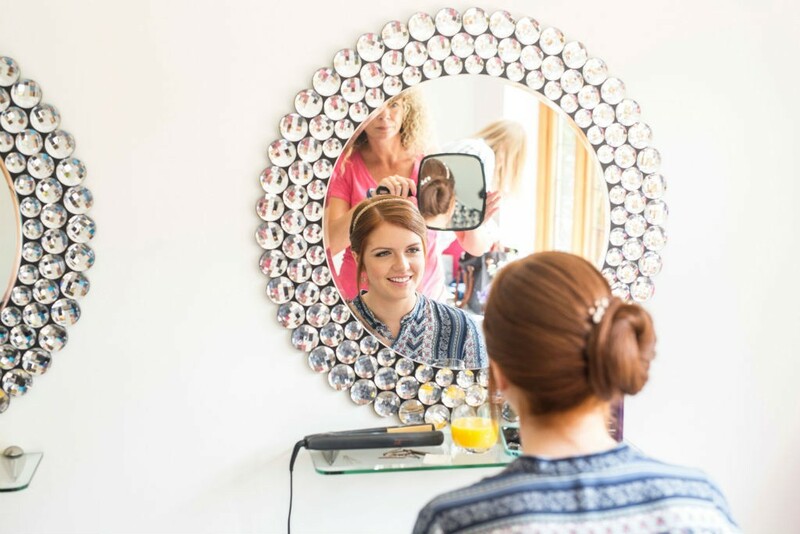 We had viewed a few venues before going to Rivervale Barn but once we saw Rivervale we knew it was the venue for us” – The venue is beautiful & has beautiful light rooms which helps to get amazing shots. 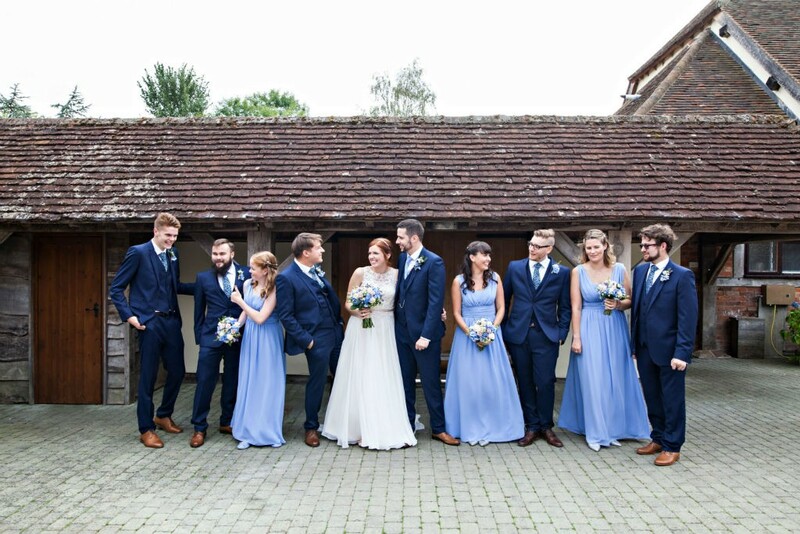 The couple opted for a pastel colour pallet for their wedding. 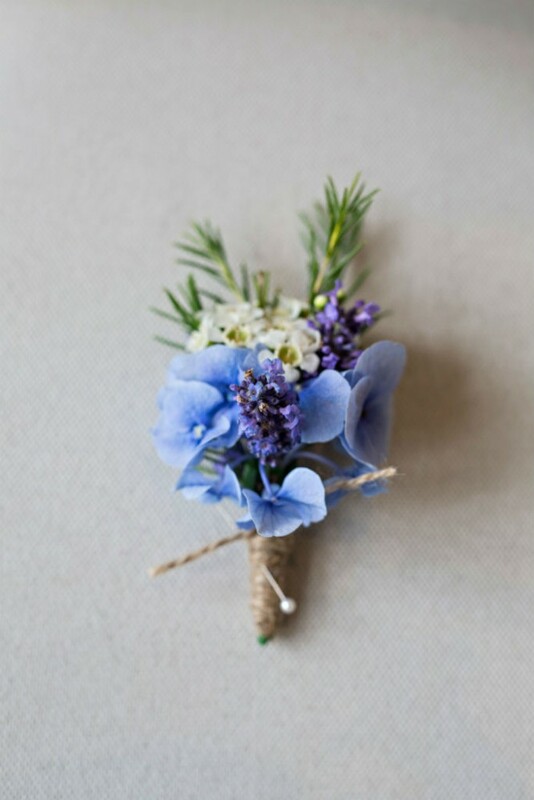 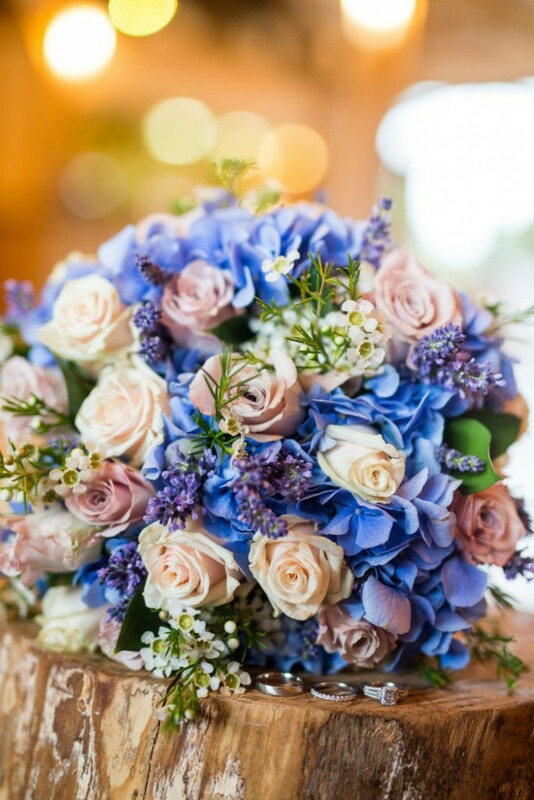 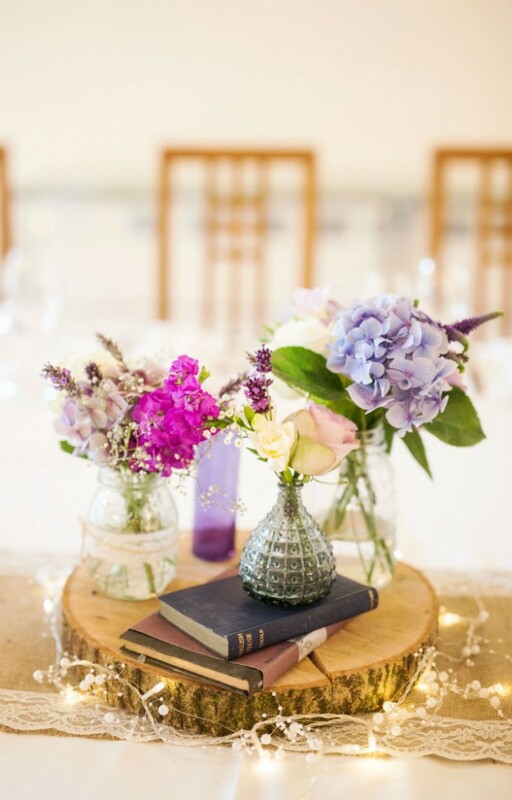 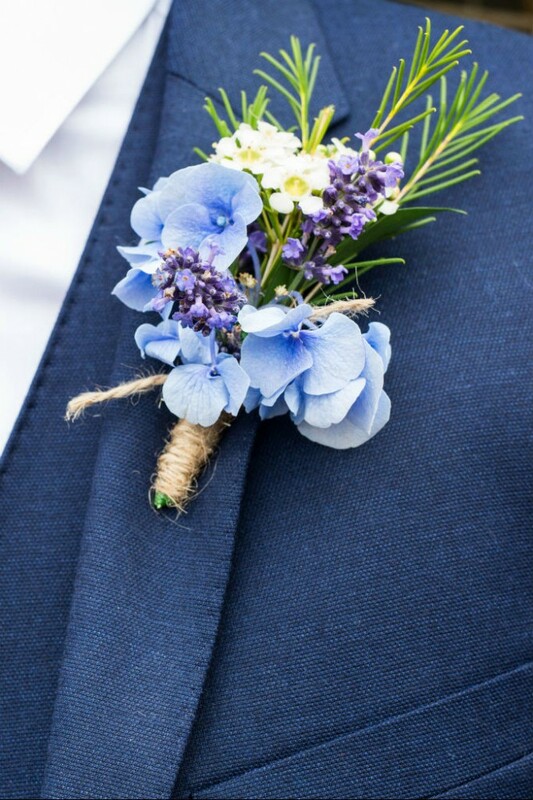 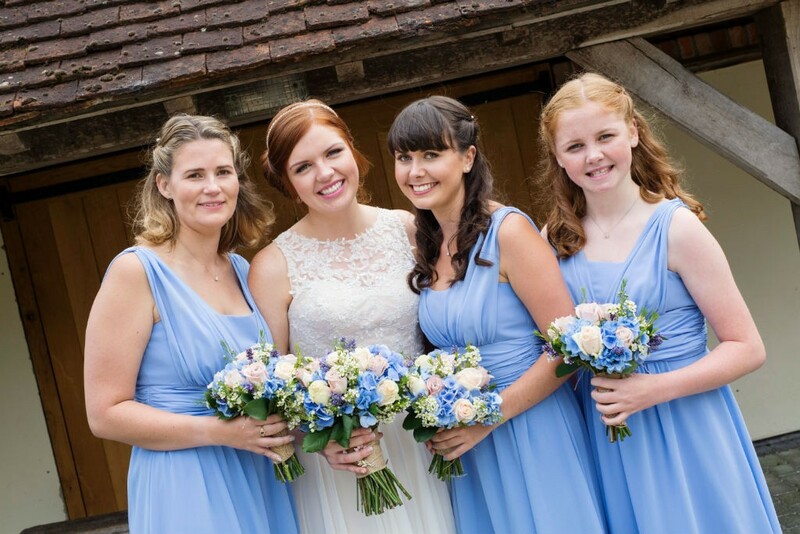 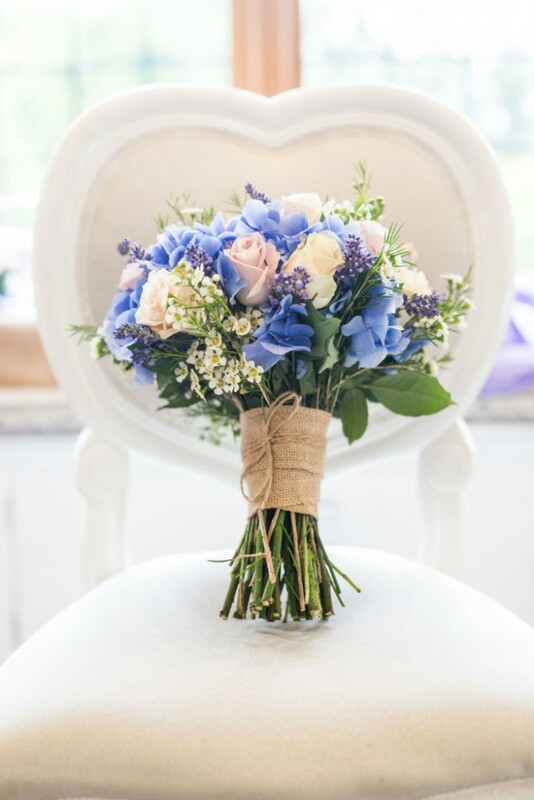 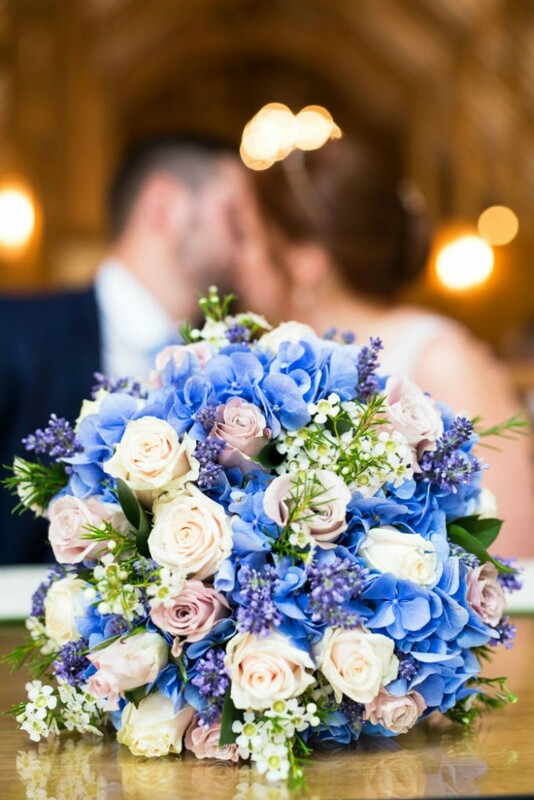 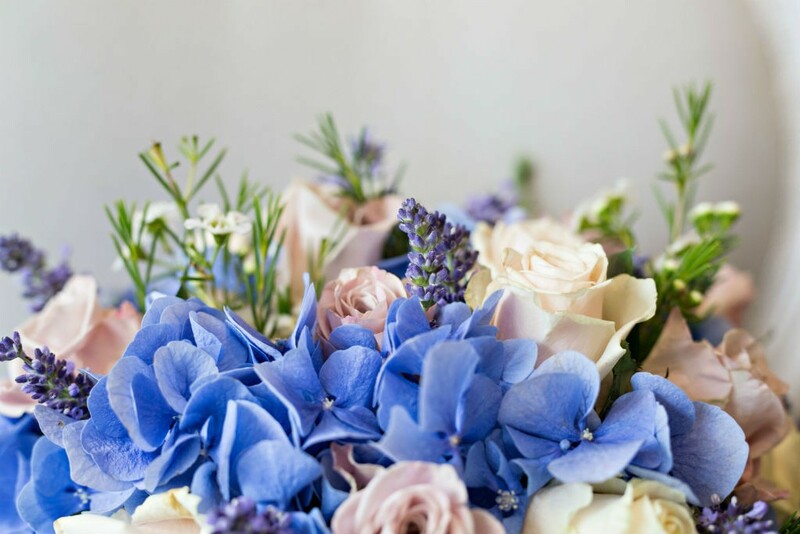 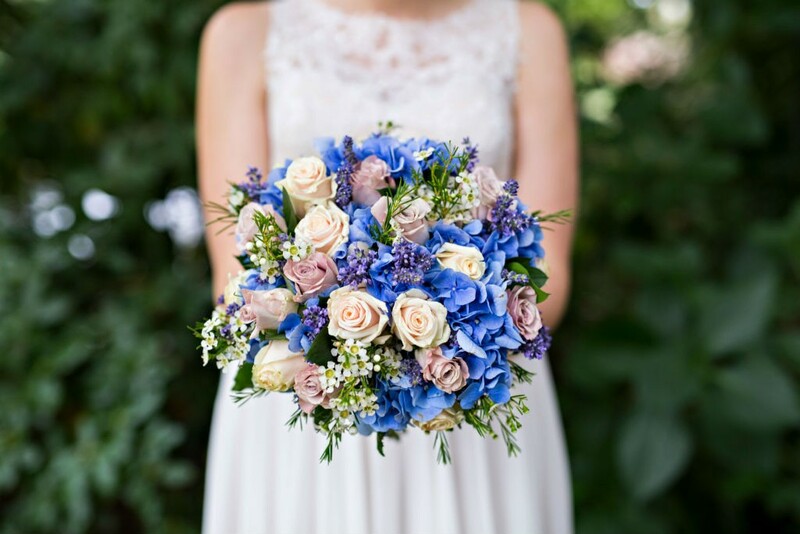 The bridesmaids wore periwinkle blue dresses & looked absolutely beautiful – the flowers were gorgeous – blue hydrangeas, lavender, roses and wax foliage in pastel colours. 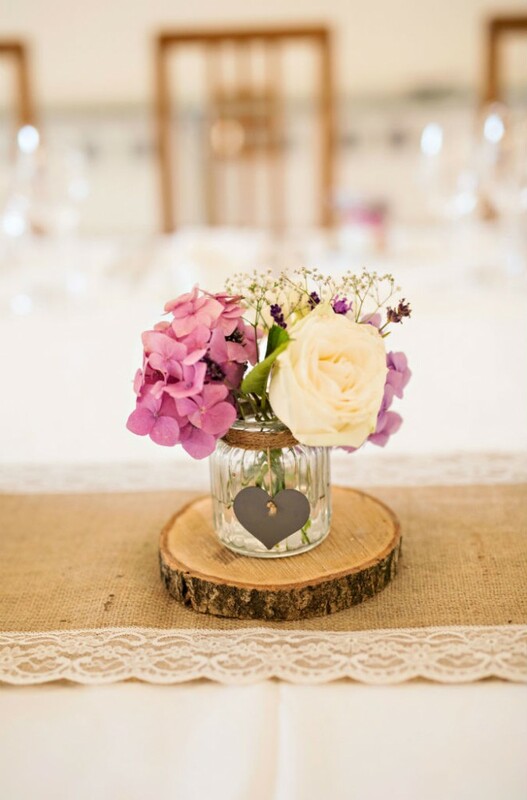 The rest of the decor all complemented each component perfectly and suit the rustic theme the couple wanted. 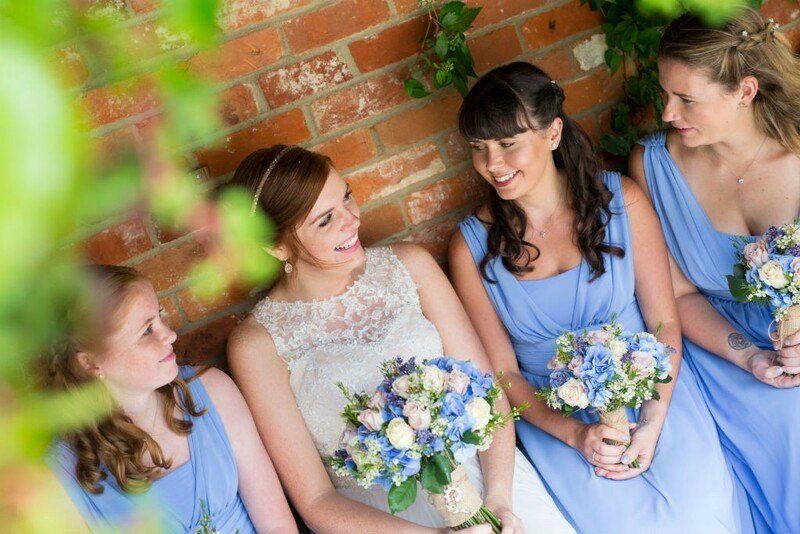 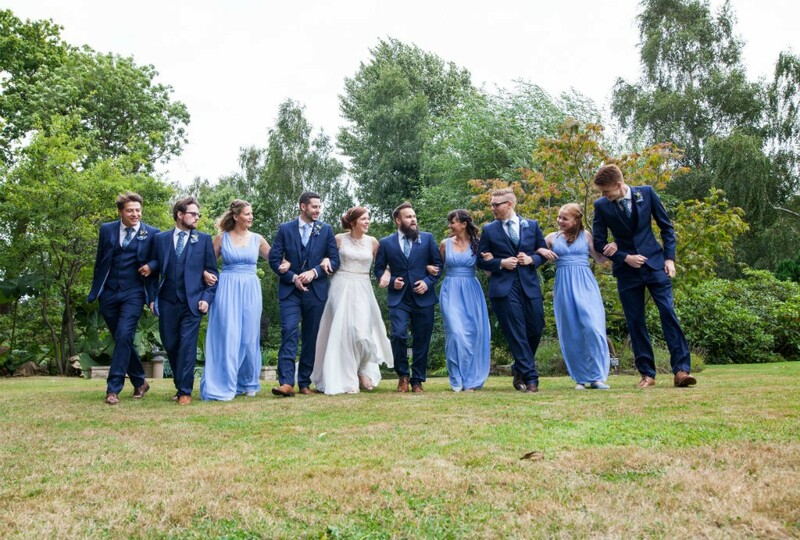 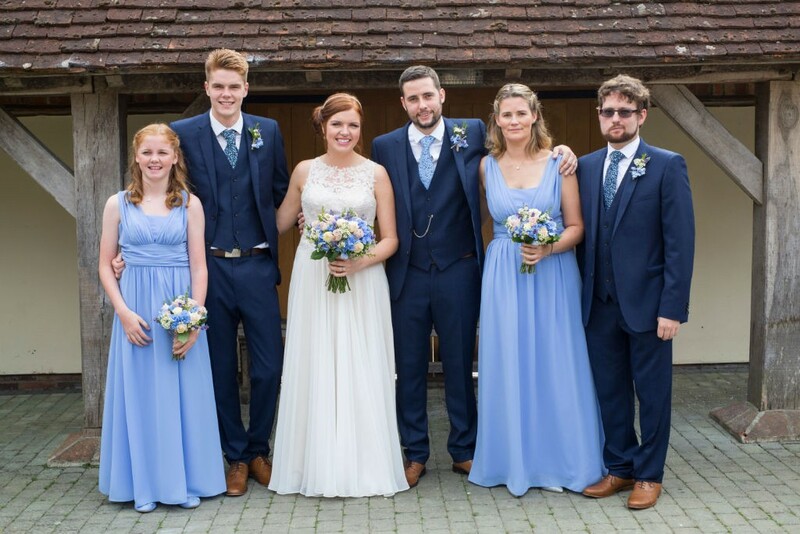 Amy’s dress & Bridesmaids dresses were from Borrowed Blue & Lace. 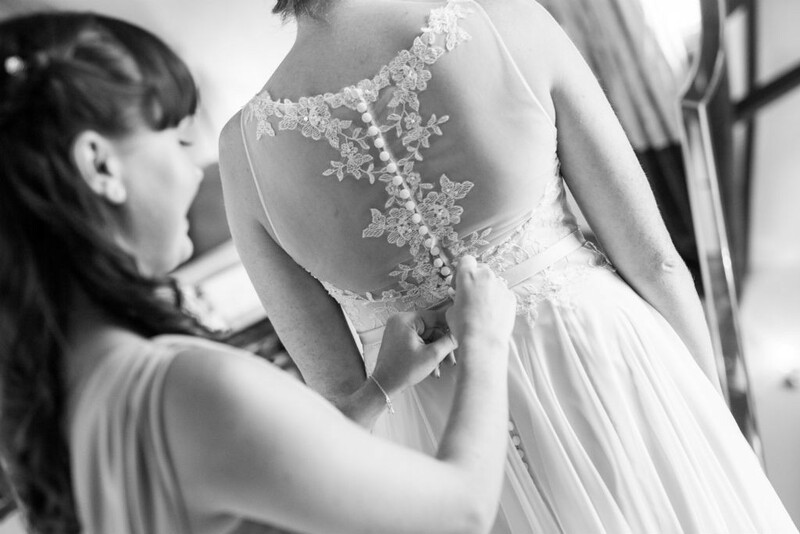 Amanda Wyatt was the designer of Amy’s Dress. 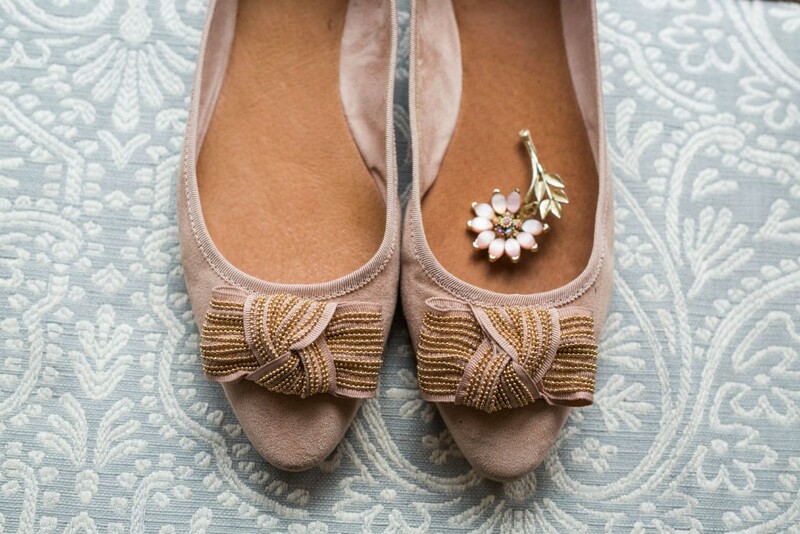 The accessories were from Accessorise & shoes from Next. 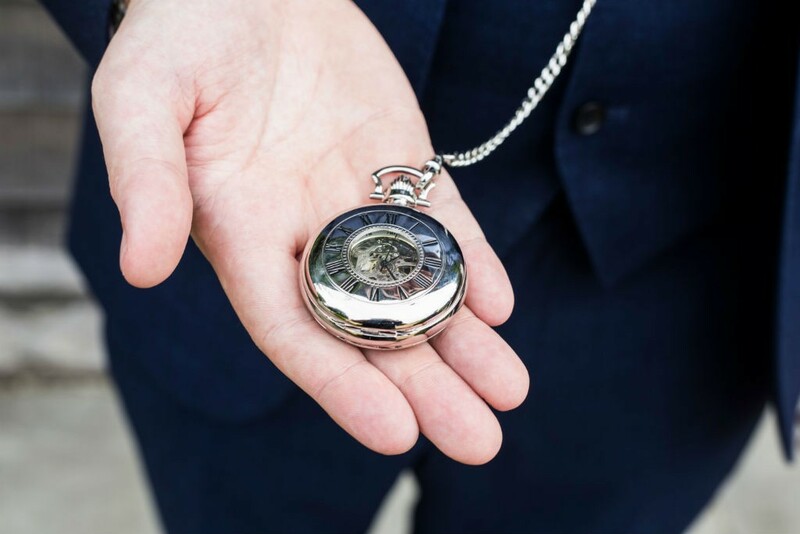 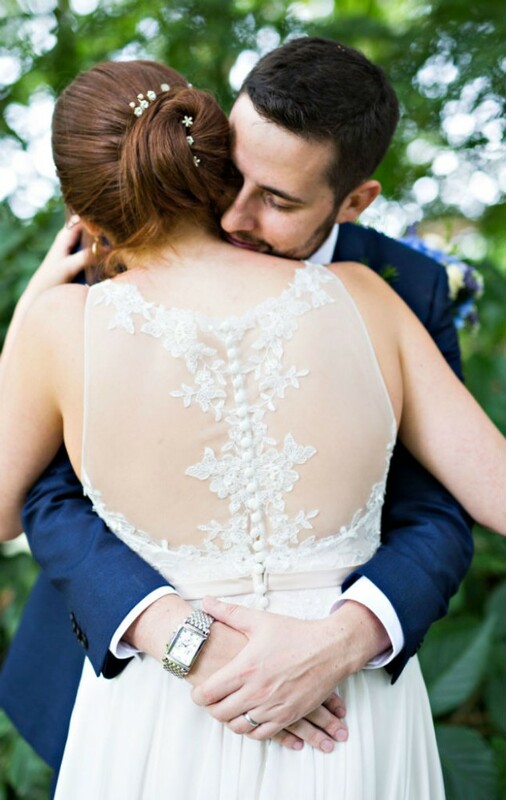 Amy had a vintage brooch on her bouquet, that was once her Nans – this was a lovely touch. 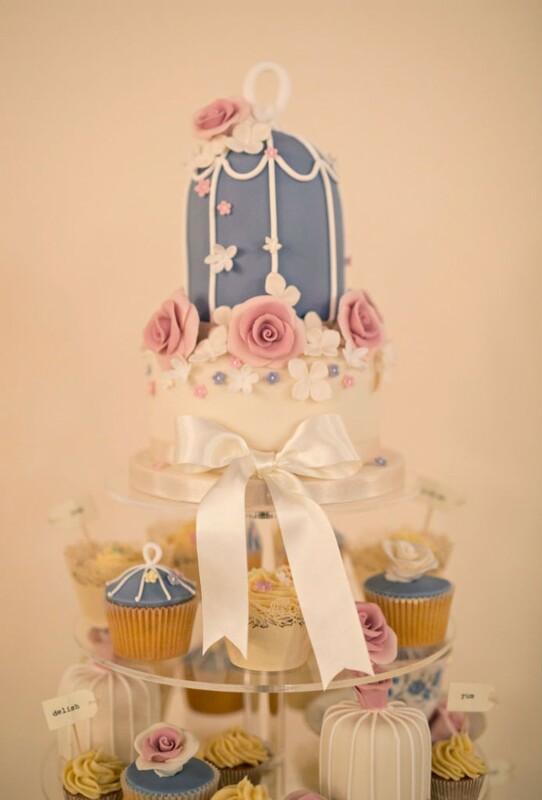 The couples wedding cake was by Vanilla Cake Company. 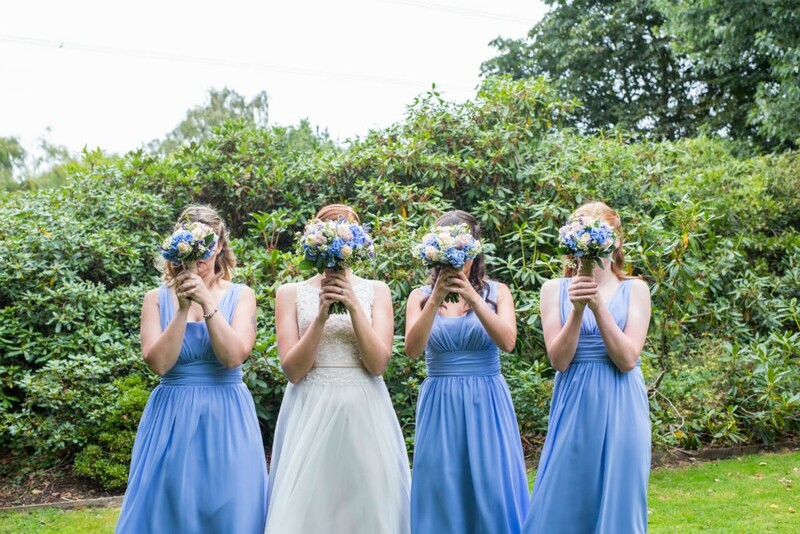 They wanted it to be a mixture of pastel colours, with pastel blue being the main colour. 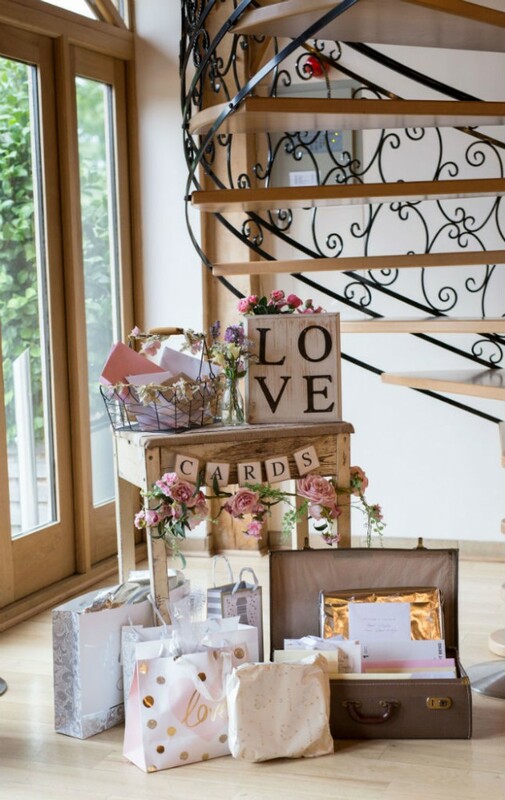 They had a bird cage at the top of the cake, which matched their wedding invites. 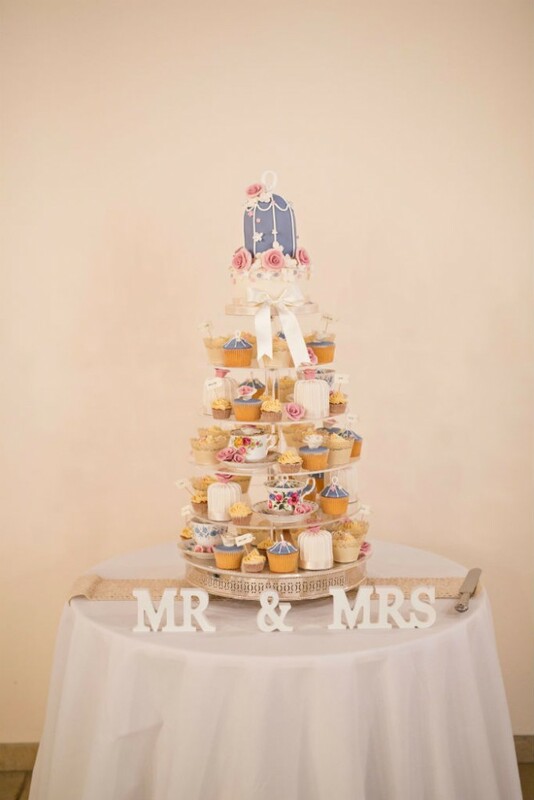 The tiers below were a mixture of different sized cupcakes in different flavours. 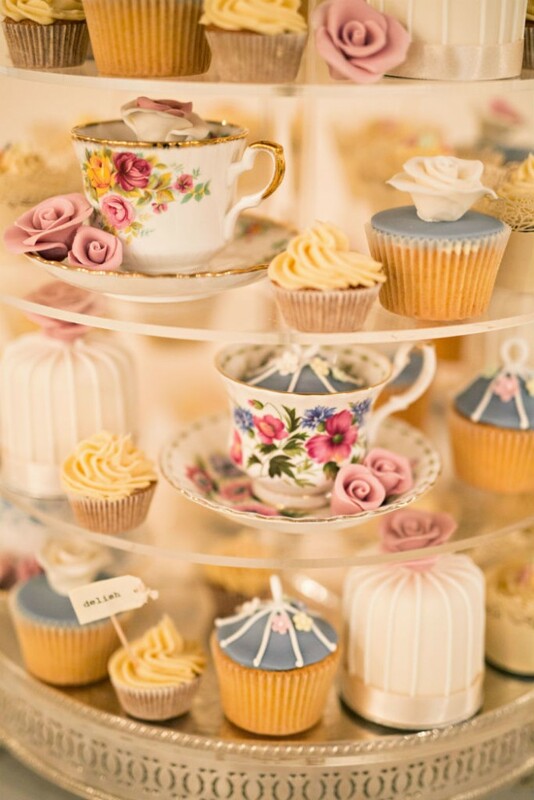 Some of the cupcakes in cups and saucers that my Nan & Grandad picked up from local Charity Shops. 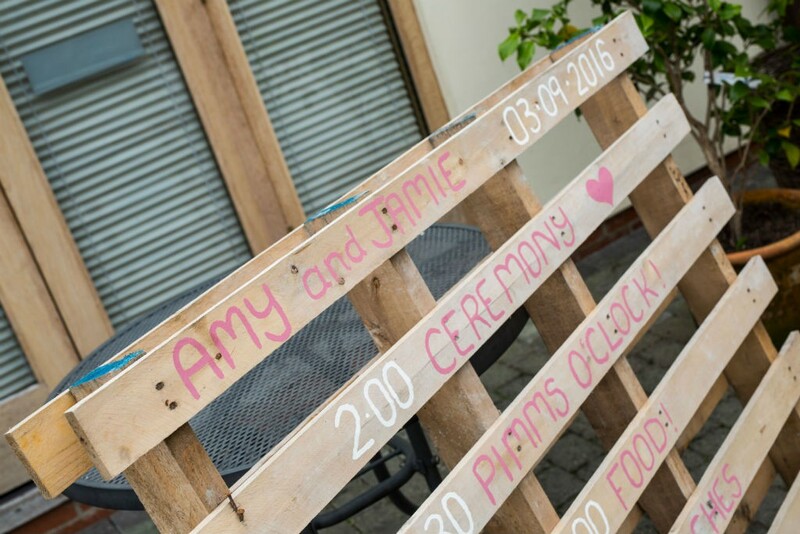 The Maid of Honour Racheal made the ‘Mallett Pallett’ this was pallett that Amy’s Dad got that Racheal decorated with the order of the day, it was something Amy had seen on Pinterst and was a really nice and cheap idea! 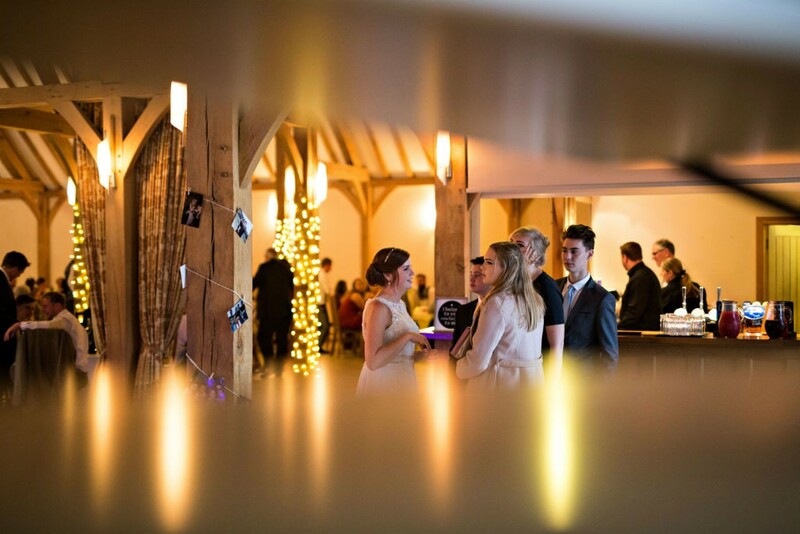 We also had photos up in the barn hanging on twine from the pillars that Racheal helped with too. 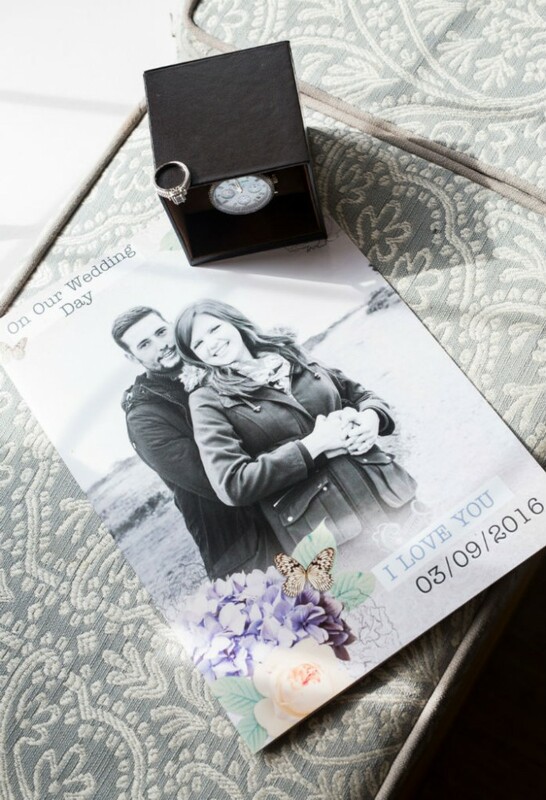 What advice would you give any other couples about planning your big day, or any tips for the day itself? 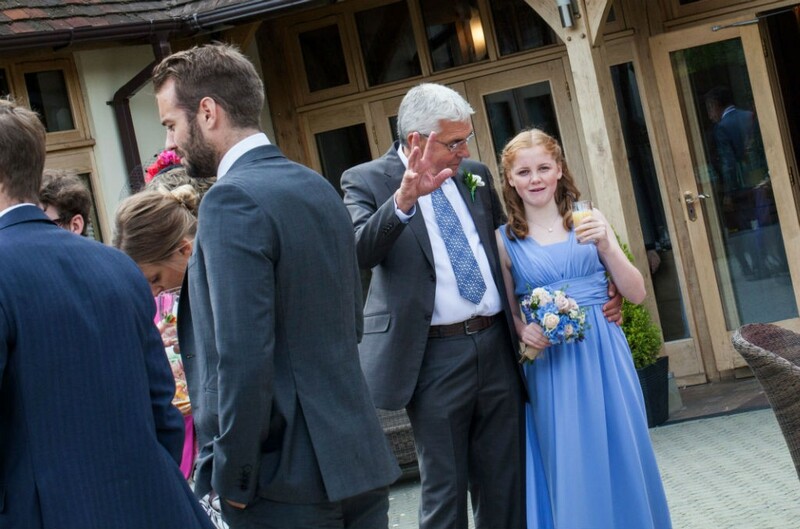 – Not to panic it will all come together in the end. 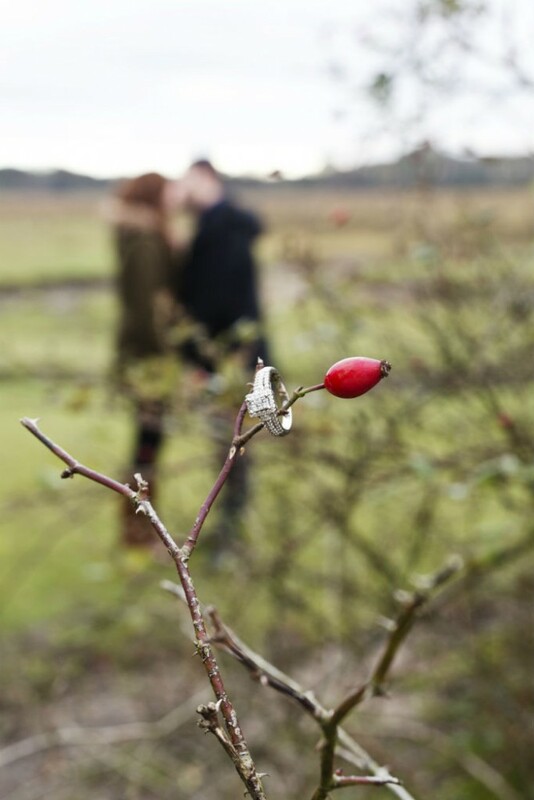 Also to make sure you spend some time with your Husband/Wife on the day and try and take in everything around you. 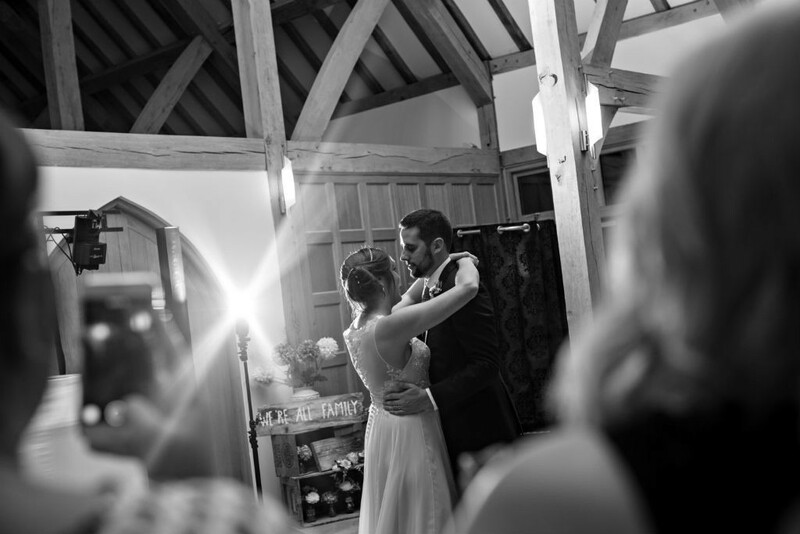 Rivervale Barn http://www.rivervale-barn-weddings.co.uk/ – the staff were amazing at Rivervale Barn, the day ran so smoothly and they made sure that everything went perfectly for us. 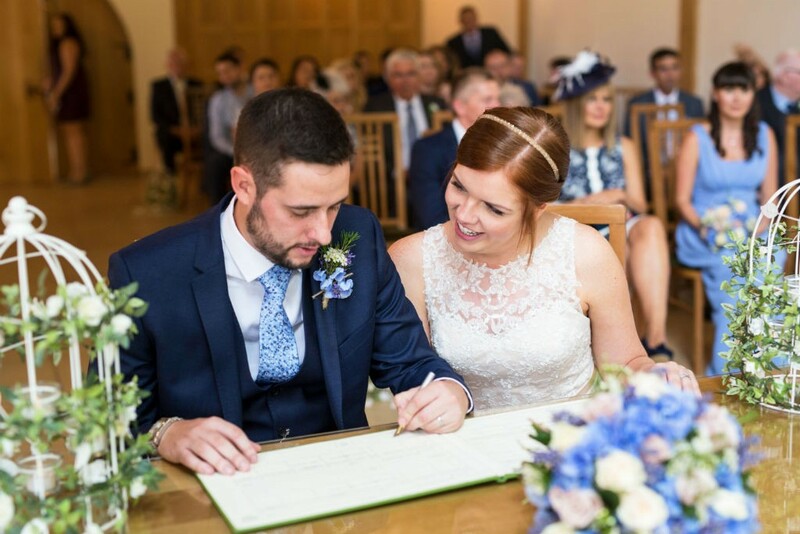 The Vanilla Cake Company http://www.thevanillacakecompany.co.uk/ – Laura was brillant the cake was perfect. 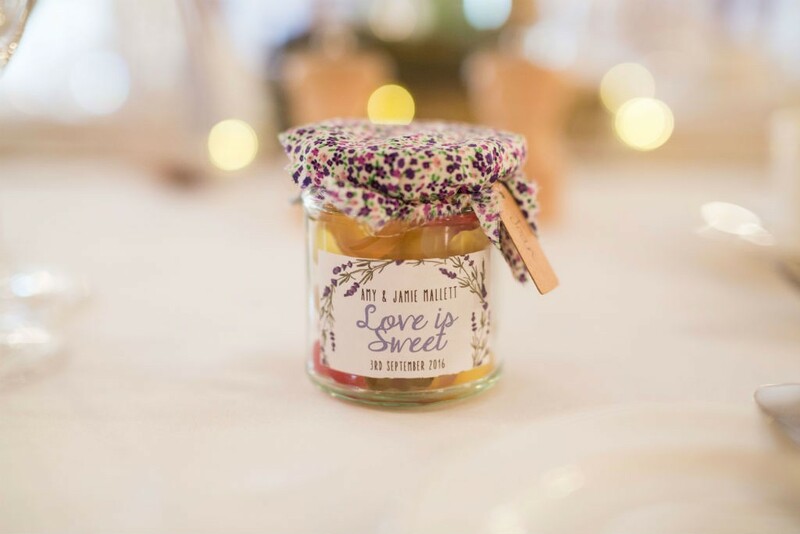 Lulabee http://www.lulabee.co.uk/ – Laura was a great help, she has some lovely items to hire and done a brilliant job on our favours. 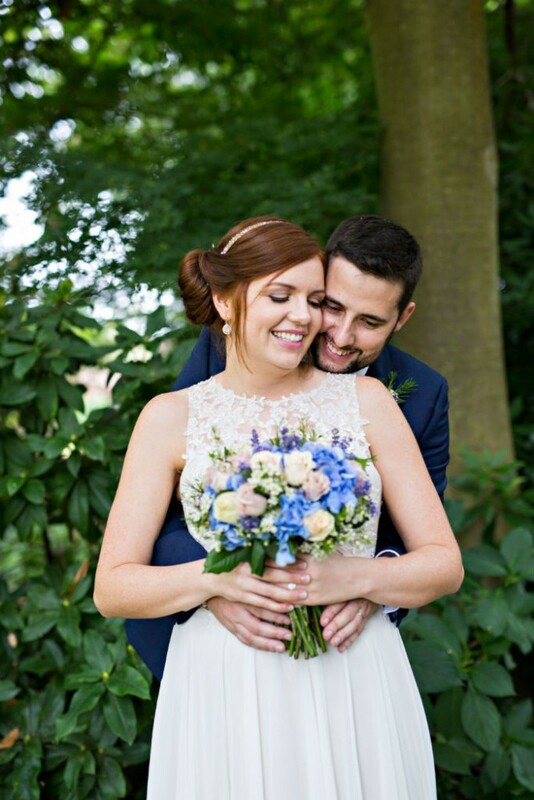 Borrowed Blue and Lace http://www.borrowedbluelace.com/ – I would highly recommend this bridal shop out of all the bridal shops I visited this was by far the best shop, their offer excellent customer service and helped me chose my wedding dress and the bridesmaid dresses.